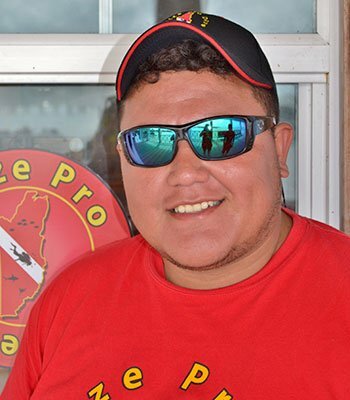 Ian became the youngest instructor on Ambergris Caye at the age of 19 and youngest Master Scuba Diver Trainer at the age of 20. However, he has 10 years of diving experience and over 500 certified students to date. Ian comes from Belize City and has been on the island for 5 years. Upon arrival to Ambergris Caye, he quickly rose up from the ranks of Open Water Diver to Master Scuba Diver Trainer. As the son of Junior he also supported the idea of establishing a top class Dive Shop and specializes in many different PADI Specialties. Safe, fun and enthusiastic, Ian will surely give you a time to remember and much more!